Adds more new cave dimensions! And some blocks, items, mobs, bosses, and optional recipes. This mod is recommends you to change config settings in the GUI. 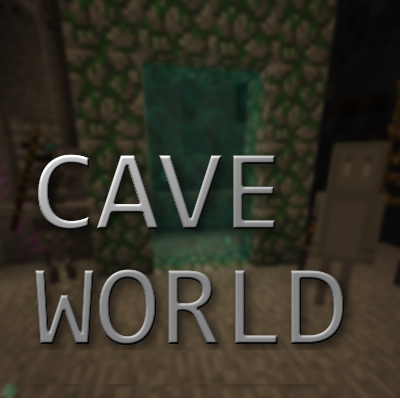 Click Mods on the main Minecraft menu and click "Caveworld 2" mod entry in the list. Click Config and change the this mod config settings. Build the portal frame of Moss Stone or Mossy Stone Bricks (4x5 minimum, 23x23 maximum). Walk inside your portal. Stand into the portal frame and wait. Mining points can get when mining ores in the cave dimensions. Miner rank will promote when the mining points has accumulated. You can get some benefits according to your miner rank. For example: If your rank is Aqua Miner or better, even though you are in the water, you can mine with ease. Mining points and miner rank will display ingame screen corner while you hold a pickaxe. This seems to cause quite a few crashes for me. Hi there, its realy nice mod. Thank you! Is it possible to disable the use of tools in the config file? That they are gone from the list of Not Enough Items and tabs or make individual picks for this mod, with which you could earn a mining points. I have in the assembly 30+ different picks and the list turns out impressive! do modded ores show up in caveworld? Can someone please provide me with information in English about this mod? I have seen the original Caveworld; my understanding of that mod was basically a solid stone dimension (or more accurately, a pair of them), with a massive cave system that had bigger "rooms" and a friendly mob to carry stuff for you, and a need to mine more to get mining points for the next level. (That may or might not be accurate, but that was my take-away from the mod description).